They visited us on September 6 to look around the facilities for cultural properties. They toured the chemical laboratory and restoration studio of the Center for Conservation Science and Restoration Techniques on the fourth and third floor, and the Audio-Visual Documentation Section of the Department of Intangible Cultural Heritage on the basement floor. Those in charge of each facility provided explanations and answered questions. They visited us on September 17 as part of learning by workplace visit. They toured the Japan Center for International Cooperation in Conservation on the fourth floor, the Library of the Department of Research Programming on the second floor, and the Audio-Visual Documentation Section of the Department of Intangible Cultural Heritage on the basement floor. Those in charge of each facility provided explanations and answered questions. The Department of Research Programming is investigating early modern genre paintings, such as Genre Figures, said to be based on the romance of Honda Heihachiro and Lady Senhime, as a joint research project with the Tokugawa Art Museum. 2010 is the 75th anniversary of the opening of the Museum, and upon this occasion a special exhibition called the “Treasures of the Owari Tokugawa Family” was held (October 2 to November 7). In light of this opportunity, on display since September 28 are the enlarged picture panels of Genre Figures and Kabuki Performance and Audience (both are important cultural properties) as part of research investigation results. Genre Figures is a relatively smaller two panel folding screen, 72.2 cm height. We had the image outputted by magnifying it by approximately 3.5 times in order to match the Honda Heihachiro’s height with the average body height of 157 cm that was assumed from the male remains of the feudal lord class in the Edo Period. When the right panel is enlarged with the same degree of magnification, the female in a kimono with crest of hollyhock, the central figure, will match the average height 146 cm of the wives and concubines of feudal lords in the same way. This lets us know that the difference in physical size between males and females of the time is accurately reflected in the portraits. 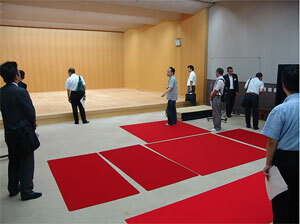 Kabuki Performance and Audience is 36.7 cm length, made up from two scrolls on which there are six pictures each. We had this scroll output by magnifying it by approximately 2.5 times. We can clearly confirm the color expression by delicate gradations and the elaborately drawn textural differences, and focus attention on detailed description, which has been overlooked until now. When the line drawings and the state of colors are observed in detail, the intention and reason for the expression techniques will come up. We will apply the information thus far obtained to the study of works and will work to deepen the understanding a variety of art pieces. The Department of Intangible Cultural Heritage has been recording the ban-utai of Master Imai Yasuo, the eldest Noh actor to perform in a Hosho style, since 2005. This September, the 100th ban-utai was recorded. The repertory of Hosho-style Yokyoku includes 210 pieces, and the major numbers have been produced a record. The memorable recording of the 100th Noh-song “Higaki” was a secret piece of music in the penetrallia which was not played as Noh, but only the utai was handed on. Mr. Imai, who is 90 years old this year, sang quietly in a straightforward manner, performing this song about a beautiful shirabyoshi (dancing girl), who grew older, fell on bad times and made a confession before a Buddhist monk. Passing on the collective recordings of Noh-songs sung by a Hosho-style Yokyoku master in the late Showa Period has a significant meaning. The plan is to continue this recording a little more. 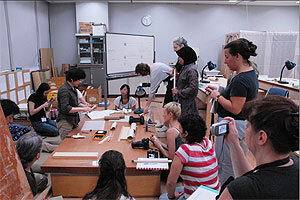 The International Course on Restoration of Japanese Paper was held from August 30 to September 17. Among approximately 80 applicants engaged in the conservation of cultural properties around the world, ten participants from Ireland, Australia, Malaysia, etc. were selected. Various topics covered in the lectures included material studies, bibliographies and so on. In the practical sessions the participants made infillings of missing parts, lining, attached axial rods, and produced a work into a hanging scroll. They also challenged Japanese-style book binding. In the study tour, the participants visited Mino city, a place famous for handmade paper also used for restoration as well. They also visited the restoration studios, such as the traditional mounting studio and the cultural property conservation studio of the Kyoto National Museum. 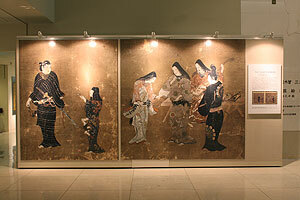 The handed down techniques and knowledge lead to the promotion of conservation and use of Japanese paper cultural properties, and furthermore, it is expected that they will be applied to the repairing and conservation of Japanese art objects overseas. The Center for Conservation Science and Restoration Techniques began to make public, on the National Research Institute for Cultural Properties, Tokyo website, the photos of airplanes such as the Farman, taken at the beginning of Japanese aviation at the Tokorozawa airfield. These photos were donated by Mr. Kitagawa Masanobu, whom lives in Tokorozawa in January 2009. The photos were taken by the late Mr. Kitagawa Hideo, the father of Kitagawa Masanobu, at the Tokorozawa airfield. The main recording media were glass plates. We are extremely grateful to Mr. Kitagawa Masanobu and other relevant individuals for the conservation of these glass plates and the making public of these digitized photos on the occasion of the memorable 100th year of Japanese aviation. 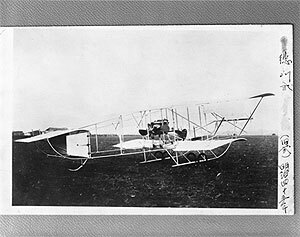 The photos posted on this occasion include the first airplane to fly in Japan, Aikoku (Patriot)-go and many other precious shots. These will definitely be very valuable materials for researchers and people who are interested in aviation. The Center for Conservation Science and Restoration Techniques will continue to make public such valuable data in the future. The Japan Center for International Cooperation in Conservation continues to cooperate with a technical support project at the Conservation Center of Grand Egyptian Museum, conducted by the Japan International Cooperation Agency (JICA). From September 14 to October 7 (a part of training sessions on September 24), six conservators of the Conservation Center of Grand Egyptian Museum were invited to Japan, and three training sessions were executed in parallel to respond to the current status and issues in the Center. At the “Conservation and restoration management” session (until September 24), Mr. Osama Abd Elsalam, the deputy director at the Conservation Center of Grand Egyptian Museum, visited the Kyushu National Museum, National Museum of Ethnology, Osaka, the National Research Institute for Cultural Properties in Nara, and the Shosoin Office, and discussed with their managers what can be done in order to improve the operation and management of the center. In the “Analysis using scientific devices for conservation” training session, three conservation scientists attended lectures and practical training at the Kyushu National Museum, the National Museum of Japanese History, and the National Research Institute for Cultural Properties, Tokyo, and learned the analytical techniques needed when using devices in conservation and restoration, the selection of devices for purposes, and knowledge and techniques in regard to application in conservation and restoration. 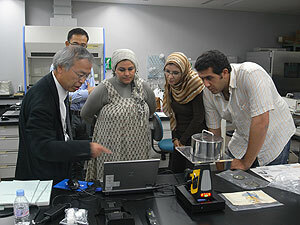 In “IPM (microorganisms)” training, two Egyptian specialists, who belong to the microorganism laboratory, executed culture, the separation and identification of fungi and bacteria at the Center for Fungal Consultation, the National Institute of Health Sciences, and the Osaka Prefectural Institute of Public Health. We will continually conduct training so that they can acquire the skills for operating scientific devices for conservation and so they may carry out conservation/restoration techniques so that the staff members in the conservation and restoration fields will be able to cooperate and supplement each other so work can be performed. 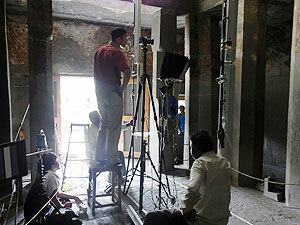 The National Research Institute for Cultural Properties, Tokyo and the Archaeological Survey of India (ASI) conduct joint research on the conservation of the mural paintings of the Ajanta Caves, under the framework of “the Exchange Program of International Cooperation of Cultural Heritage” commissioned by the Agency for Cultural Affairs and the government subsidized budget for “the Cooperative Project for the Conservation of Cultural Heritage in West Asia”, and aim to share the knowledge on conservation and exchange conservation techniques. The mural paintings of the Ajanta Caves have many problems – the leaking of water from cracks in the base rocks, biological damage, artificial damage, and discoloration caused by the past repair and the deterioration of colored layers. 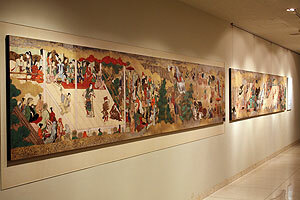 To solve these problems, it is necessary to understand the status of numerous mural paintings in detail and analyze them; however effective documentation techniques have not yet been established. Therefore, we have begun recording the status of mural paintings on high-definition photos using high-resolution digital cameras as the first attempt in the Ajanta Caves. In this fourth mission (from September 8 to October 2, 2010), we made high-definition photo recordings and color measurements of the mural paintings in the 2nd and 9th Caves jointly with the Indian specialists. The obtained data will be utilized as basic data in order to establish an appropriate mural painting conservation/restoration method, in cooperation with the Archaeological Survey of India (ASI).